The 17th edition of DJAZAGRO, the Trade Show for Agro-Food Production, came to a close on 28 February 2019. Over the space of four days, the show hosted 687 companies from 34 countries and registered more than 22,000 entries from 50 countries all over the world, up 9% on 2018. This exceptional edition once again provided the opportunity for productive meetings between machine, equipment and solution providers, and African manufacturers and investors. The number of international exhibitors at the show continues to rise, confirming the essential role played by this exhibition in the food industry. 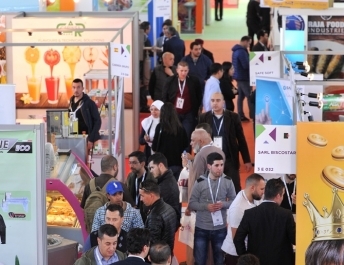 The DJAZAGRO offering was renewed in 2019, with 37% of new exhibitors, including a sizeable contingent of Algerian exhibitors (27% new exhibitors) and Chinese exhibitors (35% new exhibitors). In addition, DJAZAGRO is increasingly opening up to the world, with new Italian and Spanish pavilions and new exhibiting countries such as Belarus, Egypt’s, Finland, Malta and Ukraine. All exhibitors acknowledged the quality of professional visitors. The high presence of international players can be attributed to the potential of the Algerian market in terms of local consumption and more importantly production. On Monday 25 February, DJAZAGRO was officially inaugurated by Mr. Feroukhi Fodil, Secretary General of the Ministry of Agriculture, Rural Development and Fisheries, and representatives of the Directorate General for Forestry and the Directorate General for Fisheries and Aquaculture. Mr. Kamel Edine Belatrache, Secretary General of the Ministry for the Environment and Renewable Energy was also in attendance. The Minister for Trade, Mr Said Djellab, also visited the exhibition. The French Ambassador in Algeria, Mr. Xavier Driencourt also came to visit French exhibitors on Monday 25 February, followed by the ambassadors of the Netherlands, India, Austria, Turkey, Italy and Tunisia. DJAZAGRO also reasserted its commitment to the development of Franco Algerian relations through the signature of a convention between the Algerian-French Chamber of Commerce and Industry (CCIA) and Adepta. New this year: DJAZAGRO organised an opening conference on the future of the food industry in Algeria. Speakers from the Ministry of Agriculture, Rural Development and Fisheries, the National Investment Development Agency (ANDI) and ALGEX offered international firms the benefit of their insight to encourage them to invest in Algeria and accompany the efforts of Algerian food companies in supporting national production and its incorporation in international value chains. The subject of Franco-Algerian relations also came back to the table, with two talks organised by partner organisations: Adepta, a professional network of more than 200 French food companies, organised a technical colloquium dedicated to optimising food factories in Algeria on Wednesday 27 February. This colloquium, which was highly appreciated by its audience, dealt with new technologies and equipment for the processing and packing/filling of food products. The Algerian-French Chamber of Commerce, in association with Société Générale, also delivered a talk on the keys to understanding this market. DJAZAGRO also held two presentations addressing the promotion of local Algerian production and the development of the packaging sector: two essential issues for industry professionals. Presented by the journalist Nordine Azzouz, these round tables featured live testimonies from exhibitors and partners, followed by stimulating discussions with the audience. For the third time, the Algerian Chamber of Commerce and Industry (CACI) offered visitors and exhibitors a round table dedicated to investment and export in Algeria. Its aim was to provide tangible solutions and answer the questions of manufacturers and investors, to encourage them to consider the openings for productive investment in the food product field. To cater to increasing demand for mechanisation and automation, DJAZAGRO this year once again set up an automated bakery equipped by French exhibitors and run every day by a baker. Workshops were organised on the subject of making baguettes, brioches, pastries and fine food products from local ingredients. These demonstrations of know-how are always highly appreciated by visitors to the exhibition. The food industry in Algeria is evolving increasingly towards export, whilst also remaining a gateway for any foreign companies wishing to make inroads in the African market. DJAZAGRO 2020 will address the developments of the Algerian food industry in detail through the main theme of the exhibition: “For healthy and sustainable food”. Make a date for 6-9 April 2020 for the 18th edition of DJAZAGRO!